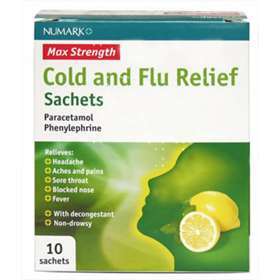 Numark Max Strength Cold and Flu Relief- 10 Sachets containing paracetamol and phenylephrine hydrochloride provide relief from cold and flu symptoms when made into a hot drink. Each sachet provides a soothing lemon flavoured drink when mixed with hot water. Paracetamol to ease the symptoms of a headache, sore throat, fever and aches and pains associated cold and flu. Phenylephrine hydrochloride which will offer relief from a blocked or runny nose. Add one sachet of powder into a mug and fill with hot, but not boiling, water. Stir until dissolved and then drink. Adults, the elderly and children over 12 years; 1 sachet every 4-6 hours. Do not exceed 4 sachets within 24 hours. CONTAINS PARACETAMOL; Do not use this product with other products that contain paracetamol. Paracetamol 1000mg, Phenylephrine hydrochloride 12.2mg, Sucrose, Sodium Citrate, Aspartame (E951), Ascorbic Acid (vitamin c).